New Winter 2018: Show the little fellow some love with a kids ornament personalized for him! 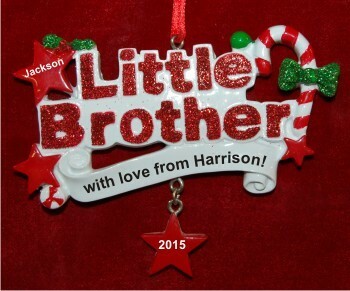 The little brother personalized ornament features candy canes, stars and enough glitter to make it sparkle in the holiday lights. This is a personalized brother ornament, so let us know the details, and they’ll be painted on by hand in a handsome font to create a truly unique memento. The my cool little brother personalized Christmas ornament is fun for any age, and it arrives with a display cord in place in our classic velvet gift pouch.